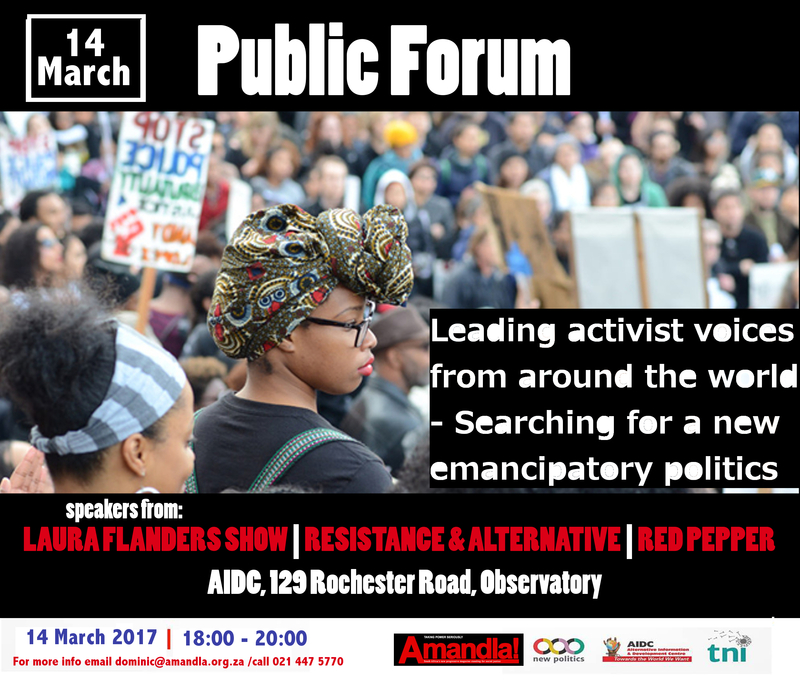 The Alternative Information and Development Centre (AIDC) and the Transnational Institute (TNI), as part of the New Politics Platform, will host an international forum on “The crisis of Politics and The Search for new perspectives and strategies”. As much as progressive forces would like to lament the decay and erosion of the social base from which progressive forces can mobilise, together with the rise of the right – introspection is required. In a sense the rise of right cannot be seen independently of the failure of the left to capture the imaginations and hearts of working class people. Moreover, the credibility of the left (who has come into power) has been questioned as a result of some left states not being able to implement human centered approaches to development – Bolivia is one example. The big question is how are we able to build a new emancipatory politics that can attract various layers of people and organization and in doing so develop counter-hegemony to right-wing populism. For this reason AIDC and TNI have brought together voices from key sites of struggle from around the world, including: Southern Africa, Latin America, USA and Europe, in order to search for new emancipatory perspectives and strategies. We will ask each of the panelists to address a different individual topic within the broader theme of the conference. The crisis of the Latin American left, is Another Politics possible? 1 Pings/Trackbacks for "Searching for New Left perspectives and strategies"